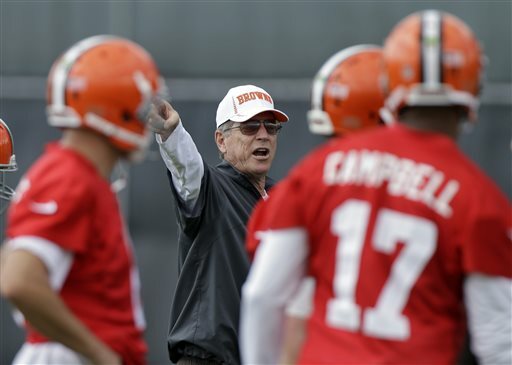 The Cleveland Browns open training camp today in Berea with a new outlook on the offensive side of the ball. But unlike the defense, the changes on offense come not from an influx of new players but from one key area – offensive coordinator Norv Turner. We’ve been intrigued to see what Turner will bring to the field ever since the Browns hired him. Even before the team has played a single game or held a real training camp practice, Turner is clearly the best offensive coordinator the Browns have employed since … well, probably Lindy Infante. From Maurice Carthon, who hasn’t had an offensive coordinator position since being fired in Cleveland; to Brian Daboll, who has had head coaches fired in Cleveland, Miami and Kansas City; to Pat Shumur, who is now getting coffee and sandwiches (allegedly) for Chip Kelly in Philadelphia, Browns fans have been witness to some of the worst offensive minds in the NFL over the years. We take a look at what Turner could mean to the Browns offense in 2013 in Part 1 of our training camp preview at The Cleveland Fan.